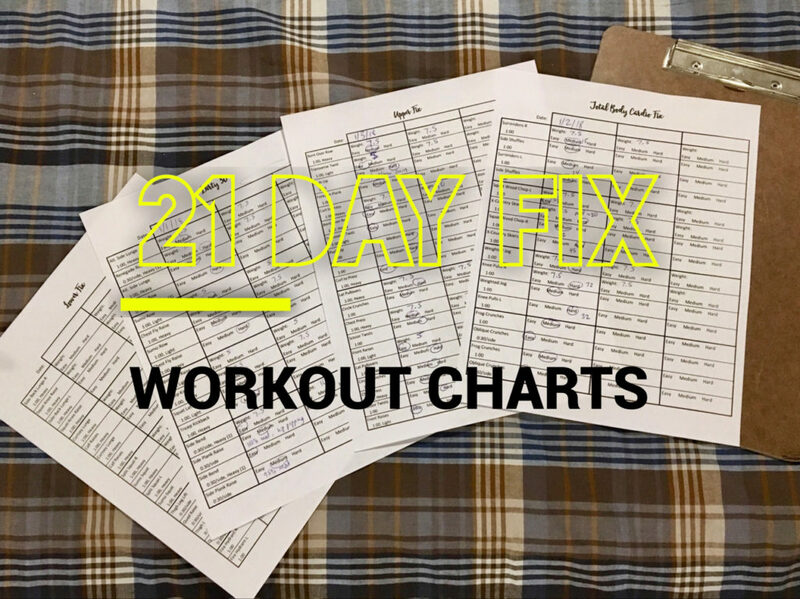 When I started to repeat the 21 day fix workouts after week 3, I realized that I was ready to move up on the weights for some moves, but not others. I also had trouble remembering to count my reps the first time through the sets. I created these charts to help my track my weights and my progress week over week. Since I have adjustable weights, this is especially helpful to get them set up for the upcoming exercise knowing in advance when I need to change them. Sounds cool. How do I use the charts? Before you work out, decide what your weights will be for each exercise and write it in on the blanks. I have the moves labeled “light” and “heavy” where that applies, to help you out. I assumed you would be using the same weight for both reps of the move on that day, so you only have to write it down the first time per move. After each move, mark a quick circle on the chart for how that went. Easy? Medium? Hard? Halfway between Medium and Hard? Did you modify for 15 seconds? Jot that down in the blank space if you want. Did you do 24 reps? Awesome. Jot that down if you want. After your workout, look over how things went. Did both sets go Easy for a move? Fill in the weights for the upcoming week (higher if you’re ready) so it will be ready for you next week. Why are there only 4 pages? I only made the charts for the days that use weights. If you like these charts and would like me to make Easy/Medium/Hard grids for the other workouts, let me know and I’ll be happy to post them.